Ask any book-loving toddler who Olivia is, and you're likely to get a big smile and an enthusiastic description of a rambunctious, creative, and lovable little pig in return. Ian Falconer's Olivia books are a bestselling sensation that has grabbed the attention of kids from coast to coast. Falconer did not start off as a writer and illustrator of children's books, but he did have an impressive background in art. After studying art at New York University, Parsons School of Design, and the Otis Institute, Falconer hooked up with noted artist David Hockney to design sets and costumes for stage productions in New York, Los Angeles, Chicago, and London. He also made a name for himself as an illustrator for The New Yorker. However, Falconer's life changed when he first laid eyes on his baby niece, who, by no coincidence, is named Olivia. "I was just entranced by her," he told Barnes & Noble.com. "I wanted to make a little present for her, so I started working on this book." That gift for his niece would become the first in a series of smash hit children's books, although it was no overnight sell. Falconer first submitted the book to a Manhattan agency, which loved his expertly rendered illustrations but felt he needed to work with an established writer. "So, I sat on it," he explains. "Then a couple of years later, Anne Schwartz at Simon and Schuster called me. She liked my New Yorker work and asked if I would be interested in doing a children's book. I brought her Olivia." Fortunately, Schwartz had the foresight to recognize the potential of Falconer's peppy pig and his first book was published. Olivia is particularly unique in the world of children's picture books because of its stark minimalism. Inspired by the similar style of Dr. Seuss, Falconer chose to create uncluttered images in black and white with the occasional splash of red. His story was equally minimal, describing the antics of a hyper-active piglet who tests her mother's patience by belting out songs, drawing on the walls, dancing, and...well... acting like a kid. "She's not really a bratty character but she does get away with a lot," Falconer says of his creation. "She manages to do what she wants, create havoc and sort of gets away with it, because whatever she's doing, it's also kind of interesting. I think Olivia could possibly be a little more thoughtful of others, but she'd be not nearly as much fun." Kids certainly picked up on the fun in Olivia, sending the book onto the New York Times bestseller list and inspiring a parade of new adventures for everyone's favorite piglet. In Olivia Saves the Circus, she spins tall tales about lion taming and tightrope walking. In Olivia ... and the Missing Toy, she plays amateur detective. In Olivia's Opposites and Olivia Counts she even teaches some valuable lessons for the toddler mindset. All of the books are distinguished by Falconer's trademark humor and unmistakable illustrative style. 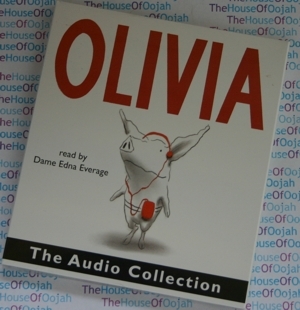 In Olivia's latest escapade Olivia Forms a Band, Olivia makes a racket like never before when she decides to start a one-pig band using items she finds around the house. Only a rapscallion like Olivia can get away with making music on pots, pans, toys, and even a pair of suspenders and still remaining 100% adorable. The book also breaks new ground as it introduces some welcome shades of blue into the visual mix. Falconer's legions of pint-sized fans will surely be delighted by Olivia's latest adventure. Meanwhile, the real Olivia is taking the popularity of the pig she inspired like a regular celebrity. "I did a book signing out in Connecticut, and about half way through the book signing, Olivia came in with her parents just to say ‘hi'," Falconer explained with a grin. "She had to have been five at the time, and she just sat down and started signing the books. She felt as if she ought to be signing as well!"